Arsenal AK 7.62×39 with Aimpoint sight on Ultimak rail, ACE stock and Magpul 30rd magazine. Having used Bulgarian, Polish and certain US polymer magazines, I am a convert. Steel is just too heavy for the same result. AK is a 3-4MOA rifle and yet nobody questions the utility of a red dot sight for improved speed and precision. Vepr 12 with Aimpoint red dot. 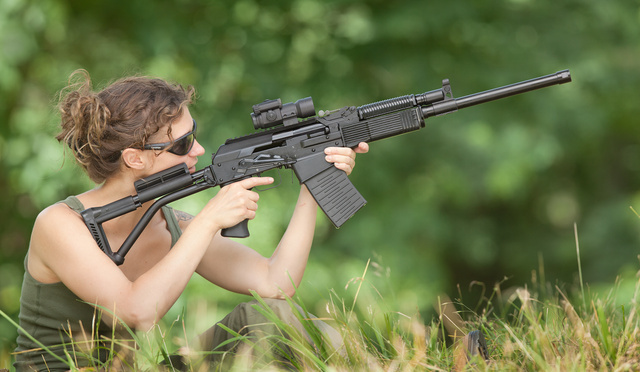 While the RPK-derived Vepr 12 are unlikely to be more accurate that the rifles, they are not appreciable less accurate out to the transonic range of the slug in use, especially if the slug is of a Brenneke type. 4MOA out to 60-80 yards isn’t unusual, and rifled shotguns can approach 1.5MOA with Brenneke or sabot slugs. Here’s a PDF illustrating terminal performance of slugs at long range, and a video showing slug use at 230 yards. So better sights are a plus even for smoothbores. This entry was posted in ammunition, rifle, shotgun, weapon and tagged 12ga, 7.62x39, AK47, Brenneke, optics, red dot, semi-auto. Bookmark the permalink. Didn’t know burns was left handed. learn something new everyday. 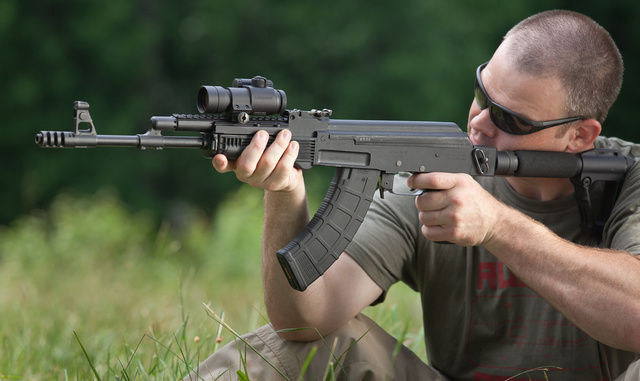 have you experienced any problems attaching a EOTech Holographic sight to a non-picatinny rail AK? I’ve used Ultimak forend rails and TWS dust cover rails, both work very well. Side mount adapters place the sight much too high. I should chime in here. The UltiMAK AK rail is only “non Picatinny” in the sense that it lacks the vertical riser under the dovetail. It is Picatinny in terms of the dovetail and cross cuts, but we ommitted the riser for the obvious reason that it would place the rail too high, and the fact that very few rail grabbers need it. The EXPS model EOTechs, with their proprietary thro-lever, will not fit any rail that lacks that goofy riser section under the dovetail, and thus it is fairly well limited to AR-15 type platforms (one of the few platforms with fully “Picatinny spec” rails out there). All the other EOTechs, including the ARMS throw-lever models, will go right on to any of our mounts with no issues, as will the vast majority of Picatinny rings and sight bases. I have on one occasion radically modified an UltiMAK AK mount to accept an EXPS model EOTech, but it something of a stunt, and its worthwhileness can be questioned in light of the fact that a) there are planty of EOTechs that fit without modification, and b) all EOTechs sit very high for an AK anyway (they are mostly an “AR-centric” product, and are very nice on an AR, but high for most other platforms). So there you have it in full. We’ve been putting eotechs on tactical shotguns for some time. Whether slug or buckshot, target acquisition and shot placement have dramatically improved. While I am left-handed, I can shoot ambixdextrously. And, while I think AK pattern rifles are wonderful for lefties, they work reasonably well for righties. The stock and rail upgrades do wonders for the AK platform, provided one starts with a good AK. I recommend the Bulgarian, Finnish or Russian versions-based only upon my own experience. You’re mileage may vary. The two main things I look at is how smoothly the action cycles and how well-shaped the magazine well is. Most other things can be fixed-aside from goofy things like bent barrels and ugly relatives.